Hello, my Friends, this time I want to write something about my real life and something also of my country, Peru. First, I want to take you back to the early 1800s. Then, the Spanish brought a lot of African Slaves to Peru. It was at the time Peru was fighting for Independence also. Peru finally got its independence in 1821. Peru is a beautiful place and if I'm not mistaken, it is the only country in the World has the the Andes mountain range, The Amazon River and jungle, and beautiful Coast, with 1300 miles of very nice beaches to the North, and the same size coastline to the South. It is a big Country, but it doesn't have enough population. We are almost 40 million of mix raced Peruvians that live in Peru: White: 30%, Natives: 50%, Black:15%, Chinese and Japanese 2% each. Also we have small populations of Italians, Jews, Germans, and well the list goes on. I guess I've been talking too much about my country. I do so because I love it. I was born in a Village a 100 Miles away from the Capital, Lima. The name of this place is Cañete. It is a big Village with a large black population. 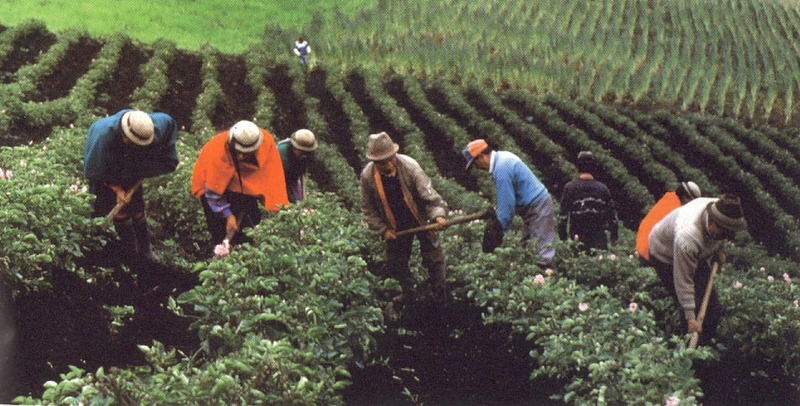 The region has older villages, too, named San Luis, San Vicente, Luna Uana, and Asia. The Spanish brought the slaves to live in the Port of Chincha near Cañete, about 50 Miles a way. But some of the slaves came to Cañete to look for work. It was the time when in that place, Cañete was a vast land of sugar cane and cotton plantations. To do that job, the plantation owners needed a lot of big and strong men, and this is the reason why they obtained black slaves. You can't imagine how difficult this work was. They had to get up at 4 am in morning and come back home at 6 pm. The people doing this job only had machetes. I don't know how they did it. They had to eat something while they were working. I really don't know how they survived the hardships of this exploitation and abuse. It was at that time when nobody got paid for work, or benefits, or health care. I also I want tell you about my childhood. I was born in that place, but I didn't live there because my parents brought me to Lima. Cañete for me is a place I'm never going to forget. I love that place because there are large valleys, nice Mountains, very nice clean rivers, large acreage full of vegetation all around. The weather is like Paradise. Most the 12 months of the year is Sunshine. The beach is not to far, and you can go walking on it. Now I'm going to tell you the sad part of this story. In 1900 my great grandfather, whose name was Manuel Cisneros, bought his family to Cañete. Unfortunately, he was a racist. He was a white man, the owner of a lot cotton plantations and he had a nice place to live. My mother says he never had any relationships with the black people. He was never interested in knowing about the black people. No one knew where my great grandfather came from. It's possible he was from Chile, but no one knows for sure. My great grandfather was from a big family, too. There were eight children. But the the big problem was the fact that he was always angry and never could agree that anyone but a white woman would marry his son. My mother told me she only met my great grandfather when she saw him in the cotton plantations, riding his horse, overseeing the labor of his workers. She recalled his horse had a lot of silver metal decorations, and he wore nice clothes, and a big hat. She said it looked like everything was expensive. My mother was hard worker too. At a very young age of 16, she started working on the plantation. She got up at 6 am, and went to pick cotton in the field. It was a very hard job because at that time the cotton companies didn't pay salaries for a day's work. They paid only by weight like 60 pounds or 80 pounds. It depended how many sacks you could load that day. She remembered at that time nobody gave the workers adequate equipment to deal with dangerous dried bunches of the cotton plant such as gloves, masks, or clothes to cover the body to avoid scratches on her arms and face. My mother fell in love on her job with my father. My father at that time worked as the driver of tractors. They met and got married very young, when she was 17 years old. They had 8 kids. My grandfather was an educated person. He went to the university and graduated as teacher of general studies. He taught primary and secondary school. He worked for the Government in Cañete, and also when he was on vacation, he went with his horses and mules to different places in the Sierra to exchange groceries with the people that live there, like rice, sugar, noodles, and beans. He brought back cheese, dried meet, dried fish, and many things they had in the Sierra. My grandfather was a very different man. He was a lovely man and everybody liked him, but he died very early when he was 60 years old. At that time I had just been born. Well my friends, I guess I've been talking too much. To finish this conversation, I want to tell you guys, that my great grandfather since he figured out that his all sons would marry black woman, he decided to move with his wife to the place he come from. That was a time when Peru didn't have roads or cars and everything had to move by horse. I guess my grandfather and his brothers married black women because they weren't any other women to choose in that village. Well, that's it for now. Adios, my friends, or as they say around here, Hasta La Vista, Baby.